Rabies is a viral disease which upon the onset of its first symptoms carries an invariable fatal prognosis. It is transmitted to humans through the bites of different kinds of animals but most of the time through stray dogs. So far no curative treatment is available. Two main varieties are seen in humans : either the furious one with an extremely restive patient who has a repulsion for water and who complains of his unquenchable thirst or the paralytic one with paralysis which spreads progressively over the body and is accompanied by pain. With both varieties the patient dies after a few days. Since Pasteur, the general assumption is that this disease has to be prevented with antirabies vaccine. It is based on the fact that the virus virulence can be attenuated with serial passages on rabbit spinal cords until a virus of stable virulence is obtained. The cord is then taken and dessicated within a dry atmosphere. A week later the inoculation of cord tissue cannot induce rabies any longer as it has lost its virulence but on the contrary it can successfully prevent the disease. With a several week long period of time between the exposure and the first symptoms, an efficacious preventive treatment is available with subcutaneous injections of vaccine prepared with cord tissue and this really represents a vaccination. When around 1890 Pasteur's first trainees Calmette*, Marchoux* and Thiroux* left the Paris Main Institute, they took along with them samples of rabid rabbit spinal cord tissue and upon their arrival overseas they carried on making serial passages. In Saigon Calmette developed a technique of immersion in glycerol which helped to keep a supply of vaccinating cord tissue as this was badly needed in Indochina where rabies was rife because of the multitude of stray dogs. Bites occurred quite more frequently there than in any other place because of a Buddhist rule which precludes the killing of any animal. In 1929, 2 624 treatments were successfully carried out which makes for that year a figure five times as large as the 1919 one. Later on, there has been some dramatic improvements in the making of vaccines with a shift from rabbit spinal cord tissue to ovine brain tissue, then to new-born mouse brain tissue and finally to tissue cultures. 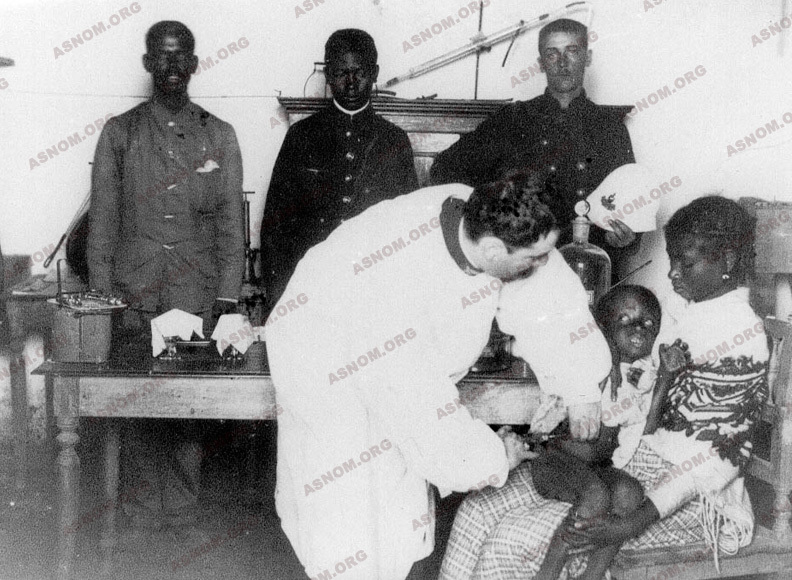 The Overseas Pasteur Institutes made this vaccine available for all territories of the French colonial domain. Thanks to the cooperation of veterinary services which perform the vaccination of domestic animals and which hunt down stray dogs, rabies, at least in cities, is now largely subsiding in tropical countries. - Atanasiu P., Gamet A. Robin Y. et Salaun J.J. : La rage in les études médicales. N° 3 et 4, sept. et déc. 1979. Le Caire. - OMS : Série de rapports techniques ; 8° rapport-824 Comité d'experts de la rage. Genève, 1992.